Yes, my soul, find rest in God; my hope comes from him. 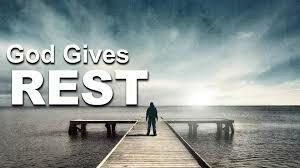 Rest – cease work or movement in order to relax, refresh oneself, or recover strength. It is not easy to find rest these days. Time seems to be rushing by and leaving me a bit breathless. There is barely time to get done what needs to be done and when we find rest physically our minds are going a mile a minute trying to remember everything that still needs to be done. I have found that even on vacation, I have an itinerary of things that need to be done or seen in order to make the trip successful. I usually end up tired, stressed and cranky. But, the Bible commands us to find rest in God. We need to discover or become aware of ways to cease work or movement (including mental movement) in order to relax, refresh and recover strength, surrounded and enclosed by the arms of God where we are safe and protected from the world around us. Rest is so important physically, as well as, mentally. When we are constantly running on the hamster wheel of life we burn out. We become physically and mentally exhausted. We become susceptible to depression, anxiety and the schemes of the evil one. We become so tired and overwhelmed that we lose our hope. When we lose our hope, the devil wins. The second part of this verse tells us that our hope comes from God. Hope – a feeling of expectation and desire for a certain thing to happen. A feeling of trust. When we lose that feeling of expectation in the good that is God, when we lose that feeling of trust in our God given purpose, the devil wins. The devil wants to keep us running a race that keeps us burned out and overwhelmed. The devil wants us to stay focused on our to-do lists so we take our focus off of God and the hope we have in Him. WE CAN’T LET THE DEVIL WIN!!! Challenge: I am challenging you to take time either in the mornings or evenings to find rest in God. Grab your Bible, a notebook and a pen and write whatever God brings to mind. Look up verses on rest and hope. Research verses on God as our refuge from the chaos around us. Write about your hopes and dreams. Define your God-given purpose and in writing put your trust in a God that has EVERYTHING under control. Journal everything that keeps you from resting mentally. I have found that the days I journal and lay it all at God’s feet that I feel peace. Find that rest in God and never lose hope that God has everything under control.